Paul Doran is our newest resident at our Hill Street Studios. After working for many years as a journalist he is now concentrating on further developing Tenx9, a story-telling event that focuses on different themes and encourages people to share their real life experiences. I worked as a journalist for 25 years (22 years in BBC NI) but am now concentrating on developing tenx9 – more live events across Ireland, increasing listeners to our podcast, more workshops, developing the commercial end of things etc etc. 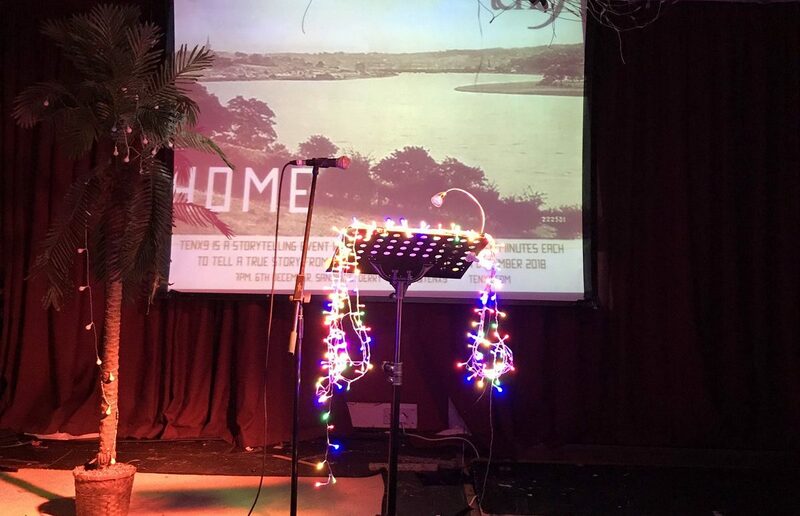 Tenx9 is a simple concept: nine people have up to ten minutes each to tell a true story from their own life on a theme selected for the evening and hosted by Pádraig Ó Tuama and me. We began it in the front bar of The Black Box in Belfast with an audience of 25-30 people. In 2014 it moved into the larger venue on site and has a regular audience of 200 people. It is always free admission but recently the audience has been encouraged to make a voluntary donation to help meet overheads. We have also taken Tenx9 to festivals across Northern Ireland, Scotland & England where feedback has been exceptional. In 2018 the NI Prison Service invited tenx9 to work with inmates and staff in Maghaberry and in the women’s prison at Hydebank. That work is ongoing. We have also worked with children who have been through the care system, two of whom later shared their story in the Black Box. There are tenx9 events in Britain, USA, Canada, Netherlands, Australia and one starting soon in New Zealand. Do you have any projects you’re currently working on that you can share? We have taken tenx9 into prisons on three occasions and will be continuing this work in 2019. What makes this so special for us is that we get stories from prison staff as well as inmates. It is in many ways a great leveller and people are very supportive of each other regardless of where they fit in the prison hierarchy. We are also planning to work with refugees and migrants later this year with a view to having some of them tell their story at a Black Box event. Have you had a chance to experience any of the other tenx9 events around the world? Pádraig went to the Nashville tenx9 which was the first off-shoot to appear and I have been to the London event where I told a story. It was very rewarding to see an idea we brought to life in Belfast, taking root elsewhere. Each event differs slightly from the mothership but the ethos never changes – always free and always true stories. Pádraig and I will be at the Melbourne tenx9 in February. I plan to attend each of the tenx9s in England and Scotland during 2019. What’s your favourite part about the events? I really enjoy hosting the evening but the best thing is that we pick a theme and nine people come up with nine very different stories – some with a very specific take on that theme, others with a looser interpretation but all very individual: sentimental, brutal, stark, warm, kind – some utterly tragic, others hilariously funny and sometimes both in the one story. All of human experience is there. You can find all of our Hill Street residents here!